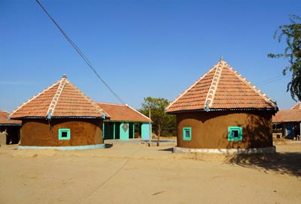 A surfeit of wide-ranging hues, abundance of design, surplus of culture, profusion of music and dance, in short, in the scorched lands of Kutch creates a mixture of loveliness, which mirrors the uniqueness, and spirit of the region. 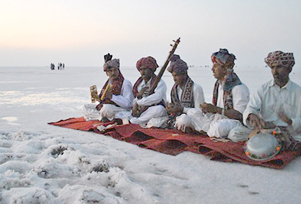 Rann of Kutch, counted among the most ecologically and culturally varied district of the state is a commemorative land of art, music, dance, and nature. For the duration of the full moon night of the winter in the middle of the breathtaking and divergent backdrop, each year a three-day cheerful extravaganza crammed with hospitality, dynamism and customary essence of the region is hosted and well known as the Kutch or Rannutsav. This 02 Nights and 03 Days itinerary is an ideal tour to Rann Utsav in Gujarat. The major destinations covered in the tour are Bhuj and Dhorbo. The major highlights of the tour are being a part of varied cultural programs, exploring traditional facet of Gujarat and enjoying the camel rides, folk dance and live musical feasts. This tour is ideal for getting soaked in the cultural diversity of the state. On arrival at Bhuj airport/railway station, meet our representative who will transfer you to the Dhordo well known as the tent city for the Utsav. Check-in at your allotted tent in Dhordo. Enjoy delicious lunch and the rest of the day is free at leisure. One can also go for shopping during leisure time at the handicraft bazaar. The different handicrafts from the star attraction of Kutch are beautifully designed and they mainly include terracotta, patchwork and embroidered items. In the evening, enjoy tea and snacks at the dining hall. Post dinner, you can enjoy cultural programs that are held in the camp area. Have dinner and enjoy a comfortable overnight stay at the camp city, Dhordo. Start your day with meditation and let your soul intermingle with nature. Thereafter, have some healthy breakfast. Enjoy the rest of the day, exploring the colours of the beautiful place. Step out to have a look at the ethnic stuff designed by the local artisans. You can also take a short trip to the Indo - Pak Border. In the evening, grab the opportunity to dance with the local folk dancers. Later return back to the hotel to enjoy a comfortable night stay in Dhordo. After breakfast in the morning, bid farewell to this unique and beautiful Rann Utsav tour. Thereafter, we will transfer you to the Railway station / Airport in Bhuj for onward journey.